Demorats have turned San Francisco into a literal sh*thole. From SF Gate: One of America’s wealthiest cities has a huge problem with public poop. Between 2011 and 2018, San Francisco experienced a massive increase in reported incidents of human feces found on public streets. In 2011, just over 5,500 reports were logged by the San Francisco Department of Public Works; in 2018, the number increased to more than 28,000. The government watchdog Open the Books documented the sharp increase over time in a stunning chart, first spotted by the BuzzFeed editor John Paczkowski. Notably, the chart of only documented reports — the actual amount of feces on San Francisco’s streets is likely even higher than these statistics suggest. San Francisco has struggled with a feces problem for years. The city even employs a “Poop Patrol” that attempts to keep the streets clean and focuses on the Tenderloin neighborhood. But the problem is bigger than just keeping the streets clean — the issue appears to be related to the city’s struggle to accommodate its homeless population amid skyrocketing rent prices and a decreasing supply of affordable housing. A 2017 survey of San Francisco’s homeless population counted nearly 7,500 people living on the street. That population faces limited public resources, and public bathrooms are no exception. Whether the Poop Patrol is able to reverse the trend on San Francisco’s streets remains to be seen, but there’s an indication that the crew is a bandage on a problem much bigger than dirty streets. Once you get past the homeless at the airport, make sure to watch out for the feces bombs throughout the city. 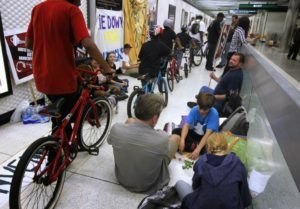 From SF Gate: Authorities at San Francisco International Airport are struggling to deal with rising numbers of homeless people arriving at the International Terminal, many of them seeking shelter in the middle of the night after riding BART trains south from the city. It’s the latest expression of the region’s increasingly visible homelessness crisis and represents another challenge for BART, which is dealing with the pending retirement of its general manager and police chief, the complex rollout of a new fleet of trains, and this week declared a state of emergency over surging crime, rampant fare evasion and “quality of life” issues. In the past two years, airport duty managers and San Francisco police officers who patrol SFO have seen official contacts with homeless people triple, according to airport figures obtained through a public records request. There were 1,139 such calls in February, or roughly 40 a day, compared with about a dozen contacts a day in March 2017. The records do not specify how the person arrived at the airport, which sits east of San Bruno and Millbrae in San Mateo County, or describe the result of the encounter. But airport officials noted that a large percentage of these unsheltered people arrive on the last BART train each night, which pulls into the International Terminal after 1:30 a.m. and empties out, with no return run to San Francisco. At that time, the terminal is mostly empty — departing flights have ceased — and airport officials said the arrivals raise security concerns. On March 27, records show, San Francisco police officers had 33 contacts with homeless people at SFO, all at the International Terminal area by the BART station. Nineteen of those contacts occurred during the midnight shift. From 10 p.m. to 6 a.m. every day, the airport allows only employees, ticketed travelers and people dropping or picking up fliers to be in the terminals. While Yakel said the majority of the contacts with homeless people stem from the final train each night, BART officials disagreed. They said perhaps four or five homeless people are typically encountered each night at the airport, which is consistent with other end-of-line stations like those in Richmond and Fremont. “I don’t think there’s any doubt that these people don’t have any permanent housing and they end up at SFO,” said Jim Allison, a BART spokesman. A BART police officer does a sweep through the last two trains of the night, along with the train operator, when they reach SFO, Allison said. SFO employees and San Francisco police officers assigned to the airport also screen people coming off those trains, asking them where they are headed, and respond to homeless people who sometimes make their way into the terminal. BART does not allow people to remain on trains when they are out of service — and with the airport’s isolated location, there isn’t an easy exit, officials said. Currently, San Francisco police hand out tokens for a free bus ride on SamTrans, which has 24-hour service to SFO and connects to locations from Palo Alto to San Francisco. During the day, many homeless people contacted at the airport are provided BART passes. “The notion of pulling them off a BART train and putting them on a SamTrans bus is not solving the problem, it’s just shifting it,” Yakel said. As a result, he said, the airport and BART are working with San Mateo County homeless services agencies to try to get help for individuals. The phenomenon has intensified as the transit agency deals with an estimated $25 million-a-year fare evasion problem. On Monday, BART began a monthlong enforcement blitz to attack it. Three days later, General Manager Grace Crunican shocked the board of directors when she announced she’d be leaving the agency in July after running BART for seven years. The MacArthur Foundation is a left-wing private organization based in Chiraq. Their focus is mass incarceration and “non-profit” journalism. But don’t let the Wikipedia page fool you – they are as far left as George Soros and his Open Society Foundation. In fact, The MacArthur Foundation and George Soros have a history, to the surprise of no one. According to American Thinker, ProPublica (the investigative-reporting foundation financed by George Soros) is also financed by The MacArthur Foundation. So what is the progressive MacArthur Foundation’s solution for overcrowded jails? Release the criminals! SF Chronicle reports that the San Francisco district attorney’s office received a $2 million grant from the MacArthur Foundation that it will use in a bid to reduce the city’s inmate population and wipe out a looming need for a new city jail over the next two years, officials said Tuesday. 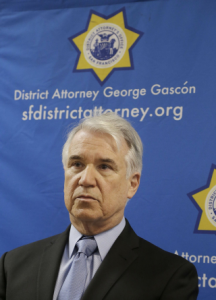 “District Attorney George Gascón outlined a plan in which his office will collaborate with experts and other criminal justice agencies to expedite cases, analyze outcomes and reduce recidivism. A focus of the reforms, Gascón said, will be inmates whose repeated troubles trace to mental illness and addiction. The goal is to reduce the jail population — which generally hovers around 1,250 — by 16 percent in two years. The effort comes as lawmakers work to reduce the city’s jail population after the Board of Supervisors in 2015 voted not to allocate $215 million for a project to begin replacing the run-down jail at the Hall of Justice. County Jail No. 4 is seismically unsafe and has no room for many programs provided to inmates at other city facilities. Instead of building a new jail, city leaders in 2016 created a 39-member working group tasked with identifying and funding programs designed to reduce what are known as occupied bed days. According to estimates, San Francisco must reduce bed days by 83,220 a year to close County Jail No. 4. The group has a hearing at the Board of Supervisors Public Safety and Neighborhood Services Committee on Wednesday. Even as the city has funded new departments to chip away at the jail population, and as recent bail-reform efforts prompt more inmates to be released before trial, the jails have not significantly thinned. That’s because most of the recent programs target lower-level offenders, and inmates who spend 15 days or less in jail occupy only about 3 percent of all bed days, said a report this year by the city Controller’s Office. Inmates who spend 180 days or more in jail take up about 78 percent of bed days, the report found. Gascón, who has opposed building a new jail, hopes the approach funded by the MacArthur Foundation grant can reduce the jail population enough to close County Jail No. 4. “We have done a lot of things, but we’re still basically in the same place that we were three years ago,” he said. The grant will fund services for inmates, a policy analyst for San Francisco Superior Court, and another analyst to study who is in custody. The district attorney’s office will bring in experts to collect data and identify ways to reduce the jail population. Around 40 percent of the jail population receives psychiatric treatment and 15 percent suffer from a serious mental illness, according to the city legislative analyst’s office. Even so, people in custody wait 120 days on average for a bed in a community-based residential treatment program — more than five times the wait in the community, said Tara Anderson, director of policy at the district attorney’s office. I love how they assume that once out of jail, mentally-ill criminals will show up to scheduled psychiatric treatment appointments. Just what the city of San Francisco needs: More mentally ill and addicted folks roaming the streets! Brilliant solution, proggies. Video NSFW due to cursing. Large, progressive-run cities on the west coast all have a homeless crisis: Seattle, Portland, San Francisco, etc. MILLIONS of taxpayer dollars are stolen to solve the problem keep the homeless industrial complex alive. In September I did a blog post that included two videos from The Michael Anderson Show, where he bravely went out and showed you an entire city block and family bike path that was taken over by homeless. Anderson is back exposing to the good Portland mayor, Ted Wheeler, another area of his city that is run over by filth and garbage. The area Anderson exposes is between SE 96th and SE Division. He states that the homeless area stretches around for about four city blocks. This part of the “City of Roses” includes homeless encampments, mentally ill people and trash everywhere including needles, feces and material that is a generally a health hazard. Anderson interviews a homeless man who claims that a private citizen pays him $40/load to pick up trash. Another homeless person claims he is paid $80-90/month to pick up trash. This is odd considering that Oregon taxpayers are giving the bureaucrats $31 million to fund the Joint Office of Homeless Services. Why do private citizens need to cough up extra monies for garbage collection when they are already contributing MILLIONS of dollars to the homelessness? The saddest part is where Anderson interviews a US military veteran and he states that many homeless have drug issues and they just don’t want to be helped. Anderson goes on to describe the amount of money the city has spent to solve NOTHING. It’s a vicious, vicious cycle that progressives are not willing to solve. After all, someone’s gotta keep that homeless industrial complex alive. Liberal utopia of San Francisco: Feces, needles and drugs, oh my! Videos NSFW due to some cursing. Well if the good mayor says so it must be true, right? Let your eyes be the judge of that. I’m sure there are many laws being broken by the homeless in these videos: unlawful urination or defecation, disposal of rubbish, drug use, vandalism, and creating an impassable sidewalk along with health and fire hazards, etc. The above videos were uploaded this past July by The Michael Anderson Show. The first shows the area of NE 6th & Everett Street. The second is a family bike path on N Macrum Ave & N Lombard Street. These areas look like a third-world country. You better open your progressive eyes, Portland citizens. Your “City of Roses” looks like a sh*t hole. Like many west coast, progressive run cities, San Francisco has a homeless crisis. The city has doubled the amount of taxpayer money they spend on the crisis and as of 2017 there were almost 7,500 homeless citizens. Yesterday Mayor London Breed announced that taxpayers will be committed to spending $100 million to attract a modular housing factory to build more affordable housing. See her press release here. Mayor London N. Breed today announced a commitment of $100 million in City taxpayer funding to purchase affordable housing made using modular construction built in San Francisco. The commitment represents the first production order for a new modular housing facility that will be built in the City in partnership with the San Francisco Building Trades. The City selected the international design firm Nelson Worldwide to conduct a feasibility study for a new modular housing factory on Port-controlled industrial lands. Nelson Worldwide has already started conducting stakeholder meetings, data collection, and analysis necessary to support a future facility to determine capital investment requirements, operational and staffing goals, and supply and demand targets. The second phase of the feasibility study, expected to be completed by the end of year, will develop the business plan for the future factory. Whenever government utters the words “cost-effective” and “union jobs” in the same sentence, I question what they have been smoking. The city does not know at this time who will run the facility. The mayor hopes the city’s promise to buy modular homes will entice an operator to open a facility. The modular housing manufacturer won’t be providing any homes for YEARS. The city is hoping that modular homes could bring down construction costs by 10 percent as technology improves. Of the total cost for a modular home and land (up to $800,000), city taxpayers fund approximately $350,000 per unit after grants and other funding sources. The mayor thinks the city can shave $50,000 off the cost of each unit. The city is estimating that the $100 million will provide around 400 apartment units. Read the SF Chronicle article here. There’s quite a bit of “hopes,” “thinks,” and “estimates” in this taxpayer-funded project. I think it’s cute that the mayor can make a prediction of cost savings per unit when the feasibility study isn’t even complete. Is she an expert in predicting future construction costs and real estate market values? I understand a long-term solution is desirable yet question just how competently a progressive, government-run project can effectively solve any issue. One thing I know for sure, that union endorsement is going to pay off for the Teamsters. This will no doubt help keep the homeless industrial complex alive. From Fox News: Cities can’t prosecute people for sleeping on the streets if they have nowhere else to go because it amounts to cruel and unusual punishment, which is unconstitutional, a federal appeals court said Tuesday. The 9th U.S. Circuit Court of Appeals sided with six homeless people from Boise, Idaho, who sued the city in 2009 over a local ordinance that banned sleeping in public spaces. The ruling could affect several other cities across the U.S. West that have similar laws. It comes as many places across the West Coast are struggling with homelessness brought on by rising housing costs and income inequality. When the Boise lawsuit was filed, attorneys for the homeless residents said as many as 4,500 people didn’t have a place to sleep in Idaho’s capital city and homeless shelters only had about 700 available beds or mats. The case bounced back and forth in the courts for years, and Boise modified its rules in 2014 to say homeless people couldn’t be prosecuted for sleeping outside when shelters were full. But that didn’t solve the problem, the attorneys said, because Boise’s shelters limit the number of days that homeless residents can stay. Two of the city’s three shelters also require some form of religious participation for some programs, making those shelters unsuitable for people with different beliefs, the homeless residents said. The three-judge panel for the 9th Circuit found that the shelter rules meant homeless people would still be at risk of prosecution even on days when beds were open. The judges also said the religious programming woven into some shelter programs was a problem. “A city cannot, via the threat of prosecution, coerce an individual to attend religion-based treatment programs consistently with the Establishment Clause of the First Amendment,” Judge Marsha Berzon wrote. The biggest issue was that the city’s rule violated the U.S. Constitution’s Eighth Amendment against cruel and unusual punishment, the court found. The amendment limits what the government can criminalize, it said. “As a result, just as the state may not criminalize the state of being ‘homeless in public places,’ the state may not ‘criminalize conduct that is an unavoidable consequence of being homeless — namely sitting, lying, or sleeping on the streets,'” Berzon wrote. The ruling shows it’s time for Boise officials to start proposing “real solutions,” said Maria Foscarinis, executive director of the National Law Center on Homelessness & Poverty, whose attorneys were among those representing the homeless residents. In 2007, the 9th Circuit ruled in favor of homeless residents of Los Angeles, finding that as long as there are more homeless residents than there are shelter beds, a law outlawing sleeping outside was unconstitutional. Both sides later reached an agreement and the entire case was eventually thrown out. In 2009, a federal judge said a Portland, Oregon, policy designed to prevent people from sitting or lying on public sidewalks was unconstitutional. Portland officials now must also give campers at least 24 hours’ notice before cleaning up or moving unsanctioned camps. A state judge rejected a similar anti-camping law in Everett, Washington. 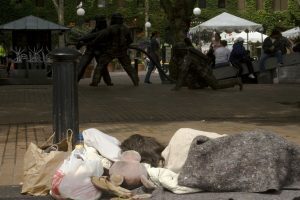 Sara Rankin, a professor at the Seattle University School of Law and director of its Homeless Rights Advocacy Project, said the ruling will serve as a wake-up call to local governments, forcing them to invest in adequate supportive housing for the chronically homeless. West coast, progressive-run cities are (in the words of Lophatt) in a race to the bottom! From Fox News: Even as San Francisco bans plastic straws in an effort to clean up the city, the streets are now reportedly littered with plastic caps from free syringes. The orange plastic caps come from the free hypodermic needles that officials hand out to prevent diseases spreading among drug users. The city hands out an estimated 400,000 syringes each month for drug users, but has little control on how these needles are disposed of. The San Francisco Chronicle previously reported more than 154,000 needles end up in the streets, sidewalks, parks and playgrounds. Meanwhile, leaders in the California city are hoping to prevent plastic straws from washing up in the San Francisco Bay. The city unanimously approved in July a plan to ban plastic straws and stirrers, as well as food containers made with fluorinated chemicals. Items such as condiment packets and napkins will be given out at bars and restaurants upon request. But these days, the orange plastic syringe caps are freely found scattered on streets and sidewalks, the Washington Post reported. Breed said implementing the plastic straw ban is addressing a future problem, while working to clean the streets of items such as human feces, a Public Works crew dubbed the “poop patrol,” is addressing a current issue. A radio producer for KTTH in Washington, Daron Casey, recently visited San Francisco and tells a story of how he was immediately attacked by a homeless person. Within an hour of arriving on the streets of San Francisco Daron was assaulted. He was hit by a homeless man in the stomach which nearly knocked him over. He wasn’t hurt too badly at all yet it could have been worse had the homeless man had a knife or other weapon on him. Daron was too scared to take a picture of the homeless man. The event spooked Daron enough that he did not want to walk around the city. Daron went on to describe the city as “third world country” within a city. Streets were filled with tents and garbage and homeless people were openly committing crimes. There were no police around to stop any criminal activities. Read Daron’s whole story about the event here. If you’re planning a trip any time soon to San Francisco, you’ve been warned! According to a report by Zero Hedge, a position on the “Poop Patrol” pays $184,678 in salary and benefits. The California city, which has been battling increasing homelessness over the last couple of years, launched a new pilot program called the “Poop Patrol,” which is set to scour targeted neighborhoods looking for human waste. The city’s 311 service has received nearly 14,600 calls about piles of poop, other human waste and dog feces since the beginning of the year. The “Poop Patrol” – part of the city’s Pit Stop program which provides staffed public toilets around the downtown areas – will begin patrolling the alleys around Polk Street and other hot spots in a vehicle equipped with a steam cleaner. Department of Public Works director Mohammed Nuru said the city will spend about $750,000 to search for and clean up human waste. “So, what happens is we’re going to take one of those crews out and try to get ahead of those calls and look for these locations so that hopefully we can get less numbers of calls coming in,” he told KTVU. 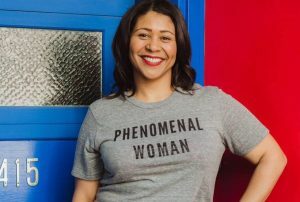 Last month, the city’s new mayor, London Breed, said the amount of feces scattered on the streets of the wealthy city in recent months was among the worst she has ever seen. San Francisco in recent years is reported to have spent $241 million and $275 million from annual budgets on homeless outreach services and programs, most of which, according to the San Francisco Chronicle, involve supportive housing units that get people off the streets. For the first time, the city’s overall budget this year will top $11 billion, the Chronicle reported. Out of the 7,499 homeless people recorded last year, about 58 percent, or 4,353 people, were marked as unsheltered. The other 3,146 were designated sheltered. The plan is for the Poop Patrol to begin this month and, if it works, the city will look to expand the effort.